Islands, because of their discreetness and often simpler biological communities, have served as living laboratories for the study of ecology and evolution and have shaped our thinking in fundamental ways. Island pollinator communities are often depauperate, frequently lacking key pollinators present in mainland communities. This has lead to the recurring observation that island plant species typically display flowers that are small and non-showy. 1) ECOLOGICAL FILTERING. The process of ecological filtering, in the context of species dispersal to islands, occurs when only species with a particular set of traits are able to successfully establish and maintain populations on islands. This results in a non-random set of island species represented from the source pool of mainland species. As an example, Grossenbacher and colleagues (New Phytol. (2017) 215: 469-478) found that self-compatible plant species are over-represented on islands. This may be due to ecological filtering, whereby self-compatible species are more likely to establish and maintain populations on islands relative to self-incompatible species. It is also the case that self-compatible species often have evolved reduced floral displays including flower size. 2) ADAPTIVE EVOLUTION. The process of adaptive evolution occurs after species have established island populations and evolve traits in response to selective pressures unique to island ecologies. As an example, Yamada and colleagues (Plant Syst Evol. (2010) 288: 113-125) found that populations of Weigela coraeensis (Caprifoliacae) on islands off the coast of Japan had on average a smaller floral tube length compared to that of mainland populations. From pollinator observation data, they suggest that the evolved difference is due to the absence of bumble bees on islands, that otherwise frequently visit W. coraeensis on the mainland. Instead, on islands, W. coraeensis is visited by small halictid bees. Phylogeny of island endemic species and their closest extant mainland congener. I am examining over 150 island-mainland taxa pairs representing over 60 taxonomic families from across the angiosperm tree. Blue tips indicate endemic island species and red tips indicate mainland congeners. For my master's research, I am testing for the adaptive evolution of reduced investment in floral display among island plant species using a phylogenetic comparative approach. To do this I have collected a dataset of flower size from 150+ endemic island species from eight islands and/or archipelagos off the Pacific coast of the Americas and their most closely related American mainland congener. I am also seeing how properties of island biogeography (island area, isolation from the mainland, elevational relief, etc.) may correlate with evolutionary changes as may be predicted under the classical theory of island biogeography. Herbaria specimens of island endemic species and their closest extant mainland relative. My research would not be possible without the use of plant specimens preserved in natural history collections. I am extremely grateful to the Missouri Botanical Gardens, the Bishop Museum, the California Academy of Sciences, the University and Jepson Herbaria at UC Berkeley, the Chicago Field Museum, and the United States National Museum of Natural History for letting me explore and photograph their collections. I am also extremely grateful to undergraduates Vanessa Nhan and Sandra Mazur and lab manager Simon Innes who helped with data collection and processing. Resolving the evolutionary relationships of plant species using traditional methods has proven difficult for clades characterized by recent and rapid species diversification (often resulting in incomplete lineage sorting) and stable hybridization events. The genus Oenothera (Onagraceae; common name evening primrose) represents a species rich clade of herbaceous flowering plants that are native to the New World. Oenothera subsection Munzia consists of ca. 48 species that are endemic to South America and whose range extends along the Andean Mountain range and Pacific coastal regions. The clade’s evolutionary history and phylogenetic relationships, however, remain unresolved. Recent work towards resolving the Munzia clade has proven difficult due to its recent origin, rapid radiation and the ubiquity of stable hybridization events due to a genetic system know as permanent translocation heterozygosity (PTH). Johnson et al. (PNAS (2009) 106: 18079-1808) sequenced one chloroplast gene (trnL-trnF) and two nuclear genes (ITS & pgiC) for phylogenetic reconstruction using Bayesian methods. Results confirmed that subsect. Munzia was monophyletic, but the resolution of species was poor (support <50% Baysian posterior probabilities) likely due to the lack of interspecific variation observed among the genetic loci used for analysis. Snapshot of the nuclear gene sequencing results. To resolve the species phylogeny of Oenothera subsect. Munzia, I am working with undergraduate student, Beata Cohan. We are using two approaches to target novel DNA sequence variation within the chloroplast and nuclear genomes. First, using whole chloroplast genome sequence data, we have identified species variation in INDELs (insertions and deletions). We have amplified these regions across species and coded the presence/absence of INDELs as alternative characters states. Secondly, using transcriptome data, we have identified single copy nuclear genes showing parsimonious informative interspecific sequence variation. We are currently sequencing these genes across species. Our next steps include using parsimony and Bayesian inference to re-constuct the evolutionary relationships of Oenothera subsect. Munzia from our chloroplast and nuclear DNA sequence datasets and test for species hybridization events. Thank you to Diego Carmona who helped identified nuclear genes of interest from transcriptome data and Elena Ulbrict who generously provided the whole chloroplast genome data. Euglossa imperialis collecting floral volatiles from Gongora sp. in La Gamba, Costa Rica. Animal-pollinated angiosperms have evolved a variety of signalling mechanisms to attract pollinators. Floral scent is a key component of pollinator attraction, and its chemistry modulates both pollinator behaviour and the formation of plant–pollinator networks. The neotropical orchid genus Gongora exhibits specialized pollinator associations with male orchid bees (Euglossini). Male bees visit orchid flowers to collect volatile chemical compounds that they store in hind-leg pouches to use subsequently during courtship display. Hence, Gongora floral scent compounds simultaneously serve as signaling molecules and pollinator rewards. Furthermore, because floral scent acts as the predominant reproductive isolating barrier among lineages, it has been hypothesized that chemical traits are highly species specific. We conducted a comparative analysis of intra- and inter-specific variation of floral scent chemistry to investigate the evolutionary patterns across the genus. A generalized line drawing of a male euglossine bee of the genus Euglossa. During pollination, the pollinarium becomes attached to the underside of the mesocutellum. From Hetherington-Rauth & Ramirez (2015). Ann. Missouri Bot. Gard. We implemented a variety of chemical ecology techniques including volatile headspace collection and GS-MS (Gas Chromatography- Mass Spectrometry) to qualify and quantify the floral scent profiles of over 25 Gongora species. We additionally applied multidemsional scaling analysis to determine patterns of chemical diversity within and among taxonomic groups at various geographic scales. We found that Gongora orchids emit a diverse array of scent molecules that are largely species specific, and closely related taxa exhibit qualitatively and quantitatively divergent chemical profiles. 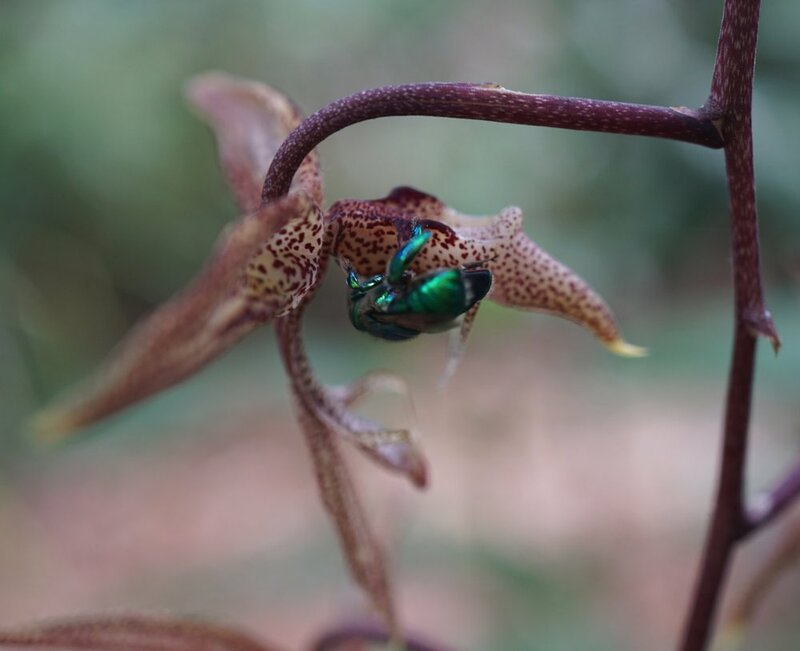 When combined with pollinator observations on a sympatric community of Gongora orchids, which exhibited distinct floral scent phenotypes, our results lend support to the hypothesis that floral scent traits regulate the architecture of Gongora- Euglossine bee associations.